We're a few weeks into the summer course I'm teaching, Literacies and Technologies in the Secondary English Classroom. Typically, at around this time of semester, I rewrite a course syllabus around the interests and needs of the class I have begun to get to know. This time is no exception. But something is different. Since I last taught the course-- two summers ago-- I have experienced for the first time the sense of being flooded by information, tools, people, to the point of being overwhelmed. It is not possible to track, do, read, try, it all. It's barely possible to maintain a finger on the pulse. At the same time, cutting off the flow of information doesn't provide the same respite it once did. So what does that mean, for me and for my teaching, especially this particular course? I think a couple of things. First, it is really important to s t o p and synthesize. Writing is an essential tool for this. Like many folks, I'm an information pack rat. I make links to interesting Web pages just in case; I keep every last byte. But my collections of information are like bureau drawers crammed full to overflowing. When I'm clicking through links, grazing on data, I don't form the same extended connections I make when I am wrestling to get an idea into prose. Second, I think that there's a new dimension to the world of the Web. The volume of information, the number of new tools and resources, all of this continues to expand exponentially. The new dimension is in the connections that form around the information, tools, and resources. I don't refer here to Siemen's theory of connectivism or Castells' idea of the network society. I am simply watching Twitter buddies coming together, usually around an idea, and working on a project: P2PU and EdCamp are two that come immediately to mind. A new Big Truth I am thinking about is, "It's the relationships, stupid." People connect digitally, they share information, and then take it one step further. Together they are using the information to do: act, create, build. So as a Web traveler, one still has to deal with a tsunami of information. Then, on top of that, one has to decide with whom and in what venue to engage with the information. You can't experience everything, everyone, everywhere. How do you pick? This is not something I see on anyone's list of Essential Skills for the 21st Century, yet in an adolescent's world where 500 friends on Facebook is not an anomaly, setting boundaries in virtual peer groups begins to look like a survival skill. How will our young people learn to do this? Especially if the adults whom they see every day secretly think Facebook is a little silly, something the children will probably outgrow in time. Does boundary-setting qualify as a new literacy? And here we are at my third point. What characterizes a new literacy? Last week, someone I know reported reading about ‘existential literacy’ and I almost fell over giggling. Technology is no silver bullet; despite all kinds of new technologies, we still grapple with the issues that we've been grappling with forever. What does it mean, to know? For whom? What’s important to know? Who decides? The information and digital era just provides the new arena/setting for opening these old packages. My question to myself is, how does the tool or practice disrupt, call us to new relationships with ideas, students, ourselves. How does the tool or practice help me emphasize to the learner that this is her journey; how does it help me invite the learner to take up the responsibility and joy of inquiry; how does it help, make, force the learner to question, seek information and another like-minded person with whom to create some new idea, product, solution? But here's the irony. How do I open these ideas in a structure where the syllabus sets the course. By course, I don't mean the entity that's shaped and marketed through an institution of learning. I mean course as in the course a runner takes. No, not a runner. A racehorse. Because at heart, in the purest form, that's what I think learners are. Beautiful, streamlined racehorses -- no, not race horses either. 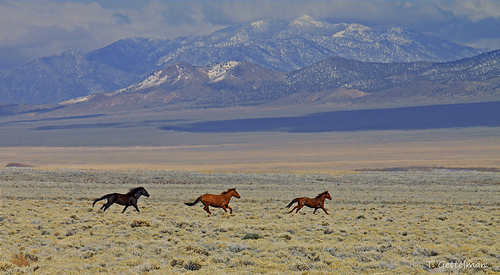 Wild horses. 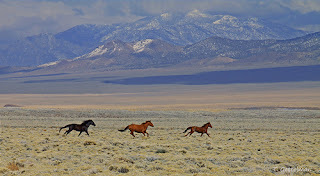 Wild horses, running, not a circular track with a starting gate and a finish line and a stopwatch, but on a beautiful open prairie, toward a point they can only imagine. Thanks for reading and responding, Susan. Yes, I think it is scary, possibly because we have barely thought of the questions yet. But I also think it's time to make the questions feel less impossible. The sub-question to all of this is, I think, "and what can *I*/*we* bring to the table today? Still scary, perhaps, but a tad more focused.